This 3.5 inch paracord needle is made from brass with a silver finish and features a threaded shaft for securing the paracord. 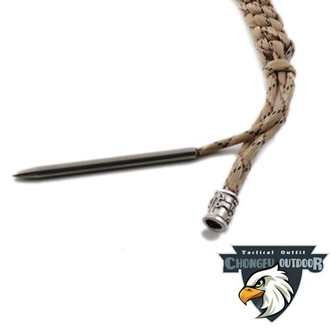 The brass paracord fid is for knitting or weaving paracord into paracord projects. The threaded hole on this fid easily fits 425RB tactical cord. With some practice, patience, this fid also works for 550 Type III 7 strand paracord. Great for adding paracord designs such as ribbons to your next paracord project. I've never used a fid before so wasn't to sure how to attach the paracord to it. The fid has a small threaded hole on the non pointy head. The hole was clearly smaller than the paracord. My first attempt at getting the paracord in the small hole was to melt the end of the paracord and while it was still hot and plyable roll it into a narrower point. This didn't work. Besides burning my finger tips through the gloves from the melted paracord, the now hard melted end woudn't fit into the fid. My second attempt was to cut the paracord on an angle and then twisting it in. This didn't work as the cut part of the paracord just frayed away. I applied a little heat to melt the fraying ends, but again the now hard melted paracord end was larger than the hole in the fid. On my third attempt, I was finally successful. What I did was extract and cut out about an inch of the inner threads. I then applied a little heat to the paracord casing, but just enough to prevent fraying. Without the inner strands at the end, the cord was much thinner. I continued to twist the paracord into the threaded opening. I threaded in about one centimeter of the paracord and it was held in the fid very securely. There is probably a better way to thread this paracord needle and if someone tells me how I will share those instructions here. Update: I retried the second method, cut on angle, melt, and roll. This is now my preferred method. When I do this I'm always amazed that the cord actually fits in the small hole. this issue with this techque is if you melt the end too much. You don't want the melted end hard.